As Professor of Arts Administration and Head of the Division of Theatre Arts, Production and Arts Administration (TAPAA), Denton Yockey oversees CCM’s Departments of Acting, Arts Administration, Dance, Musical Theatre, Opera, and Theatre Design and Production. He also serves as producer of CCM’s Mainstage and Studio Series productions. Yockey is one of the nation’s premier regional theatre producers and presenters of touring Broadway. During a career that has spanned more than 30 years, Yockey has produced or presented shows starring such luminaries as Jensen Ackles, Margaret Colin, Richard Kind, Jack Klugman, Lorenzo Lamas, Donna McKechnie, Lou Diamond Phillips, Tony Randall, Cathy Rigby, Sally Struthers, new Tony winner Rachel Bay Jones and Academy Award-winning June Squibb. Prior to his CCM appointment, Yockey served as Executive Director of the Thrasher-Horne Center at St. Johns River State College in Orange Park, Florida. He is also a principal with A Rising Tide Theatrical Group, LLC, which independently produces theatrical entertainment and national tours while providing counsel for other projects. 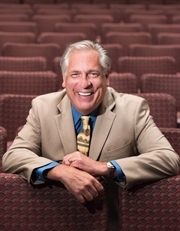 Over the course of his career, Yockey has helmed four not-for-profit theatres including Lone Star Performing Arts Association in Galveston, Texas (Executive Director); Casa Mañana Theater in Fort Worth, TX (President and Executive Producer); and Starlight Theatre in Kansas City (President and Executive Producer). Under his leadership, Starlight Theatre received the 2013 Venue Excellence Award from the International Alliance of Venue Managers in the Performing Arts Centers category. Also in 2013, his mini-tour of Miss Saigon was cited in Playbill’s list of “Most Unforgettable Experiences.” During his tenure at Casa Mañana, the landmark theatre underwent its historic renovation and the theatre was the producer and presenter of all the Broadway shows at the newly opened Bass Performance Hall. Upon his departure from Casa Mañana, Yockey received the Silver Dome Award, the theatre’s highest award for meritorious individual accomplishment. He is one of only three recipients in the 13-year history of the award. Yockey received a Master of Fine Arts degree from the University of Georgia and a Bachelor of Arts degree from Indiana University South Bend. He is a member of the Broadway League and a past Tony Awards voter for over 15 years. While in Texas he was a theatre panelist for the Cultural Arts Council of Houston and the Texas Commission on the Arts, and board member of the Live Theatre League of Tarrant County, Texas Nonprofit Theatres, Inc., and the National Alliance for Musical Theatre. A native of Plymouth, Indiana, Yockey met his wife of 26 years, Gina, on stage in a production of The Mystery of Edwin Drood. They are the proud parents of Gwyneth and Grayson Yockey, both whom are pursuing acting careers.